Before European settlement, the Secotan and Pamlico Indians, members of the Tuscarora tribe, occupied the area between Goose Creek and Bath. 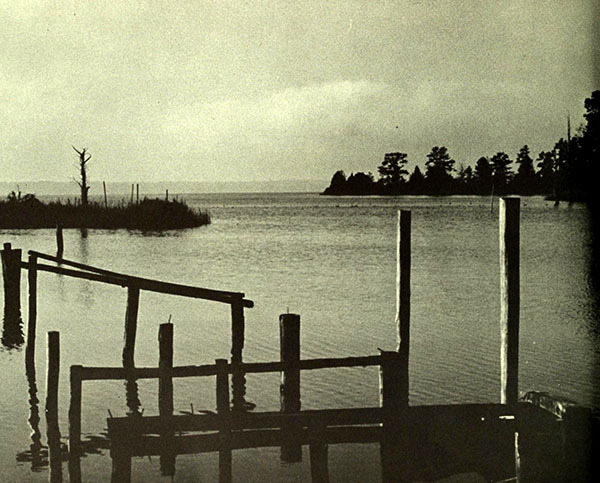 The Tuscarora were the dominant tribe during the colonial period, and conflicts arose between the Tuscaroras and settlers along the Pamlico, Neuse and Trent rivers. Well-known inhabitants of the area included several royal governors and the notorious pirate Blackbeard. In more recent times, life centered around subsistence farming, commercial fishing and timber production. Evidence of these activities exists throughout the park. Abandoned fields, once used for farming, have now returned to forests. Remnants of boat piers and loading docks skirt the river. A trackless railroad bed, used for hauling logs and the charred remains of tar kilns, are reminders of the early days of the timber industry. Like many other state parks, Goose Creek originated due to the initiative of local citizens. 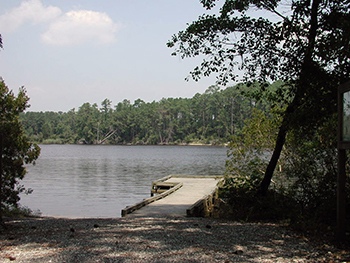 At their appeal, the Division of State Parks investigated potential park sites along the Pamlico River and determined that the Goose Creek area was the most suitable. Negotiations for land acquisition began, and a resolution to the governor expressed local support. With the purchase of 1,208 acres of land, Goose Creek State Park opened in September, 1974. Evergreen shrubs and trees grow in the ecotone between marsh and swamp. Shrubs include wax myrtle, red bay and groundsel tree. Red cedar and loblolly pine trees form the over story. The brackish marsh gradually fades into swamp where a canopy of black gum, tupelo, red maple, bald cypress and ash reaches up to 90 feet. Wax myrtle, gallberry and red bay are abundant in the understory. Pennywort and ferns flourish in the boggy freshwater swamp. Goose Creek State Park has one of the northernmost populations of Dwarf Palmetto, which can be found along the Pamlico River and within the marshes. Spanish moss drapes trees throughout the park but is most abundant in the swamp forests and along the creeks. Bald cypress thrives along Goose and Mallard creeks while black willows grow in the interior lowlands. Large, spreading live oak trees are found along creeks and river banks. In upland regions of the park there are impressive specimens of loblolly and longleaf pines. Some of these pines reach 100 feet. A diversity of hardwoods, including hickory and oak, compete with the pines. Shade-tolerant shrubs and ferns flourish below. Goose Creek is a haven for birds. The brackish marshes are home to marsh wrens, waterfowl, rails and several species of herons and egrets. Barred owls and red-shouldered hawks reside in the wooded swamps and shrub thickets. Bird life at Goose Creek varies dramatically with the seasons. In the spring, year-round residents are joined by a host of aviates who arrive from the south to nest. The growing population of osprey and bald eagles is an environmental success story, considering their declining numbers years ago due to DDT. In cooler weather, the nearby Pamlico Sound is a major wintering area for waterfowl. Ducks, including bufflehead, scaup and ruddy ducks, enjoy the open water adjacent to the park. In addition, black ducks, mallards and wood ducks inhabit the creeks and swamps. Tundra swans and Canada geese also winter in the area and have been seen on occassion at Goose Creek. Frogs, turtles and snakes enjoy the wetlands of Goose Creek. Even though the water is slightly saline, snakes, including the banded and red-bellied water snakes and the venomous cottonmouth are present. Minks, muskrats, raccoons and river otters enjoy the brackish marshes. A variety of other mammals, including gray squirrels, opossums and white-tailed deer, find food and protective cover throughout the park. Marsh rabbits live in moist areas, while eastern cottontails prefer the drier uplands. The tracks of elusive bobcats, black bears, gray foxes and red wolves testify to the presence of these rarely encountered creatures. North Carolina Division of Parks and Recreation. Goose Creek State Park. 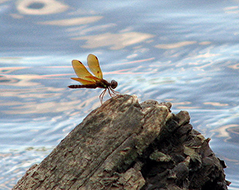 http://www.ncparks.gov/goose-creek-state-park (accessed September 1, 2015). North Carolina. Division of Parks and Recreation. Planning and Development Section. General Management Plan for Goose Creek State Park. November 1992. http://digital.ncdcr.gov/cdm/ref/collection/p16062coll9/id/214902 (accessed November 6, 2015). "View of Goose Creek from the state park camping area." Photograph. July 14, 2004. NCECHO Project, North Carolina Digital Collections. http://digital.ncdcr.gov/cdm/ref/collection/p16062coll8/id/7237 (accessed November 6, 2015). "Building Palmetto Boardwalk." Photograph. ca. 1980. 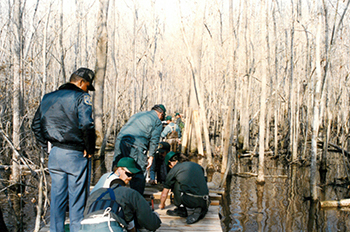 Collection of the North Carolina Department of Parks and Recreation. bobistraveling. Damselfly, Mallard Creek Trail, Goose Creek. Photograph. July 1, 2009. Flickr. Used under Creative Commons licnse CC BY 2.0. [Goose Creek State Park.] Photograph. ca. 1976. Goose Creek State Park Master Plan, N.C. Division of Parks and Recreation, 1976. https://archive.org/stream/goosecreekstatep76unse#page/n3/mode/2up (accessed January 4, 2016). - Add additional information like date of arrival and length of stay and then click Search Campsites. For each location in the list of results you receive, you will see a See Details button. Here you will find prices and a great deal of additional information.